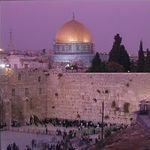 Catholics for Israel welcomes and applauds the decision of US President Donald Trump to recognize Jerusalem as the capital of Israel and to relocate the American Embassy there. Perhaps you have seen this map before; it claims to illustrate the "Palestinian loss of land" from 1946 to 2000. The problem is that the map completely misrepresents the recent history of Palestine-Israel. Prime Minister Benjamin Netanyahu speaks at the 66th session of the General Assembly at United Nations headquarters on September 23, 2011, following Palestinian President Mahmoud Abbas' speech. With God on Our Side, a 2010 movie produced by Rooftop Productions, portrays Christian Zionism as a dangerous political movement in the U.S. and a spoiler to the peace process between Israel and its adversaries in the Middle East. Since there are a number of passages in the Koran stating that God has given the Holy Land to the Sons of Israel, there can be no religious justification for radical Islamic opposition to the Jewish presence in this land. Ulpan programs - the modern Hebrew language schools - are known to be a hub of diversity, predominantly filled with new immigrants, Arab Israelis looking to learn Hebrew and Jewish students spending a semester abroad. But ulpan teachers say that in recent years, they have seen a remarkable influx of priests and priests-in-training being sent to ulpan programs officially by their seminaries. Not surprisingly, Israel's interception of the "humanitarian aid" flotilla heading for Gaza in the early morning of May 31, 2010, which ended with nine activists killed and dozens wounded, has sparked outrage and harsh condemnations from the international community. The incident has been described as an Israeli "crime" and "massacre" of peaceful humanitarian workers who only wished to relieve the suffering of the people of Gaza. Day by day the anti-Israel alliance, and sadly in collaboration with major church movements mainly from the Protestant world, is seeking to make the Apartheid label stick to Israel. We see this at present in the fortnight of global agitation known as “Israel Apartheid Week.” There is more to this scheming than meets the eye in that the real agenda behind branding Israel an “Apartheid state” is to remove the Jewish State altogether.